Locale changes your locale which changes your language and how things are translated on your desktop environment. To change your locale the Region shows the name of your local and in the drop down menu you can type the name of your locale to search through the locales or scroll through the long list. Under the Examples will show how numbers Time Currency and measurement units will be shown on your system. If you do not like the changes you can press the Reset button. The checkbox for Detailed settings allows for even more customization. Lubuntu ships with version 0.14.1 of Locale. from the command line. 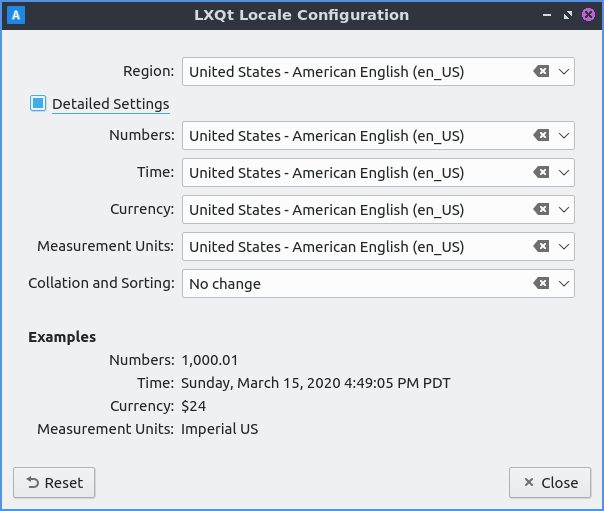 In LXQt configuration center press the locale button that looks like a flag.